Now featured on my journal at Feature - Artisan Craft Peacock ! that is so pretty! it look like a painting almost! Gorgeous how long did that take to make? Clearly made with tender, loving care, I adore the array of colours and the way you overlay the spirals delicately; simply delightful! It's FANTASTIC! I just love it! Do you say, make a sketch of the idea that you want before you start putting the pieces down? Really love the tail part. So the tail must have been improvised along the way, that's neat! Hello! Just wanted to let you know that this was featured in November's Artisan Crafts DD Roundup. Keep up the good work! Wow, love the vibrant colors! Amazing!! How did you get it to stick?! This is just amazing, you have gold hands and excellent sense The colours and composition are just great. Love, love, love! Can I draw someday what you did of paper? Aww thank you so much! Haha go ahead, I'd love to see this drawn! This must have given your hands cramps. 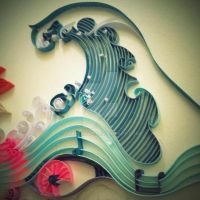 I never knew what this kind of paper art was called before. Good to know. Are they just normal strips of construction paper? Art stores sell precut quilling strips, but you can use normal paper too, if you have the patience and precision to cut them yourself! I think maybe a paper shredder would work. And I've never noticed them in stock? D: Haha, I'll keep an eye out next time, thanks! Have a nice day! Amazing! If I were you, I'd frame it when I'm done! Tried this once just off of curiosity, much harder than it looks, great job. I remember playing with these papers as a child.. I completely forgot about them. This is beautiful!! That must have taken some time. It looks absolutely amazing!